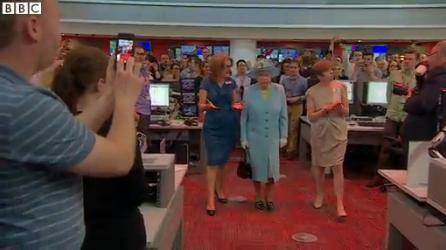 The Queen officially opened BBC's rebuilt Broadcasting House in London. Click above for an article and video from the BBC. You can't help but wish the Duke (who is "progressing satisfactorily" at the hospital) could have accompanied her as planned for this somewhat awkward visit, planned news photobomb and all. Surely he would have dropped some choice words. But the Queen had a few of her own, including referring to the famous Glastonbury Festival as "the place you get covered in mud" (true) and greeting the gift of a radio with "I don’t get an awful lot of chance to listen to the radio", which is what I would say before tossing it in the re-gift pile.